When we reach the end of our lives, do we have any regrets? What stopped us from doing what we should, or what we were called to do? A palliative care nurse, working for years with the dying, shared the top five things she heard from patients as they pass on. 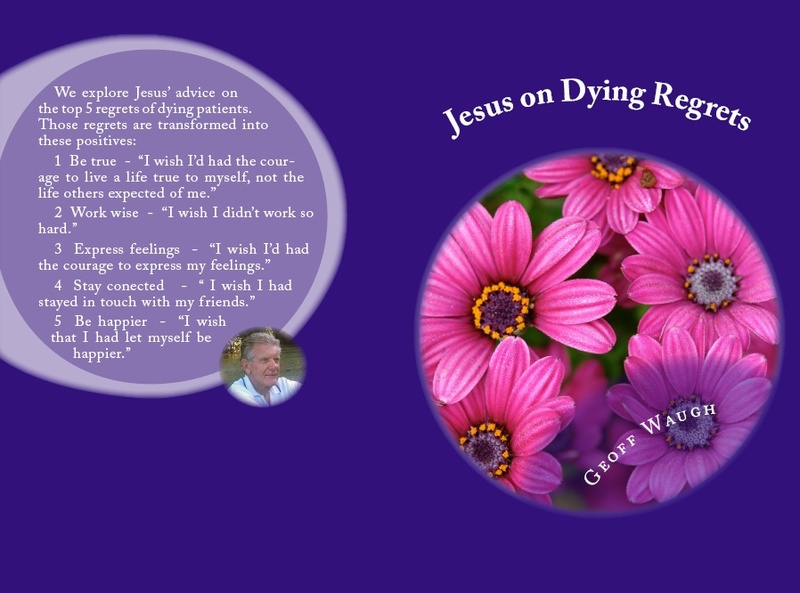 These are brief selections from the book Jesus on Dying Regrets. I have used material from FaithHub and added summary headings and quotes from Jesus and from Bible passages that relate to those regrets of the dying. The book expands on these passages. Jesus gives real life: “I came that they may have life, and have it abundantly” (John 10:10). Jesus challenges us to lose our lives to find life. “Then he said to them all, ‘If any want to become my followers, let them deny themselves and take up their cross daily and follow me. For those who want to save their life will lose it, and those who lose their life for my sake will save it” (Luke 9:23-24). Paul adds, I appeal to you therefore, brothers and sisters, by the mercies of God, to present your bodies as a living sacrifice, holy and acceptable to God, which is your spiritual worship. Do not be conformed to this world, but be transformed by the renewing of your minds, so that you may discern what is the will of God—what is good and acceptable and perfect” (Romans 12:1-2). Jesus said: “Do not store up for yourselves treasures on earth, where moth and rust consume and where thieves break in and steal; but store up for yourselves treasures in heaven, where neither moth nor rust consumes and where thieves do not break in and steal. For where your treasure is, there your heart will be also” (Matthew 6:19-20), and added, “What does it profit them if they gain the whole world, but lose or forfeit themselves?” (Luke 9:25). Jesus was even more radical in talking about living in God’s kingdom: ‘Therefore do not worry, saying, “What will we eat?” or “What will we drink?” or “What will we wear?” For it is the Gentiles who strive for all these things; and indeed your heavenly Father knows that you need all these things. But strive first for the kingdom of God and his righteousness, and all these things will be given to you as well. So do not worry about tomorrow, for tomorrow will bring worries of its own. Today’s trouble is enough for today’ (Matthew 6:31-34). Jesus calls us to live openly in the light, not in shadows: “I am the light of the world,” Jesus said. “Whoever follows me will never walk in darkness, but will have the light of life.” And he added, “You are the light of the world. A town built on a hill cannot be hidden. Neither do people light a lamp and put it under a bowl. Instead they put it on its stand, and it gives light to everyone in the house. In the same way, let your light shine before others, that they may see your good deeds and glorify your Father in heaven” (John 8:12; Matthew 5:14-16). Jesus championed openess and honesty: “Let your ‘Yes’ be ‘Yes,’ and your ‘No,’ ‘No.’ For whatever is more than these is from the evil one” (Matthew 5:37). He calls us to loving relationships: “I say to you, Love your enemies and pray for those who persecute you, so that you may be children of your Father in heaven; for he makes his sun rise on the evil and on the good, and sends rain on the righteous and on the unrighteous” (Matthew 5:44-45). ..
Jesus emphasized loving relationships: “I give you a new commandment, that you love one another. Just as I have loved you, you also should love one another. By this everyone will know that you are my disciples, if you have love for one another” (John 13:35), and gave practical examples: ’ You have heard that it was said, “An eye for an eye and a tooth for a tooth.” But I say to you, Do not resist an evildoer. But if anyone strikes you on the right cheek, turn the other also; and if anyone wants to sue you and take your coat, give your cloak as well; and if anyone forces you to go one mile, go also the second mile. Give to everyone who begs from you, and do not refuse anyone who wants to borrow from you (Matthew 5:38-42). Concerning forgiveness Jesus added, “For if you forgive others their trespasses, your heavenly Father will also forgive you; but if you do not forgive others, neither will your Father forgive your trespasses” (Matthew 6:14). Jesus reminds us that lasting joy is found in serving. The night before Jesus died his friends argued about greatness: “A dispute also arose among them as to which one of them was to be regarded as the greatest. But he said to them, … ‘But I am among you as one who serves’” (Luke 22:24, 27). After washing his friends’ feet that night Jesus said: “I have set you an example, that you also should do as I have done to you. Very truly, I tell you, servants are not greater than their master, nor are messengers greater than the one who sent them. If you know these things, you are blessed if you do them” (John 13:15-17).